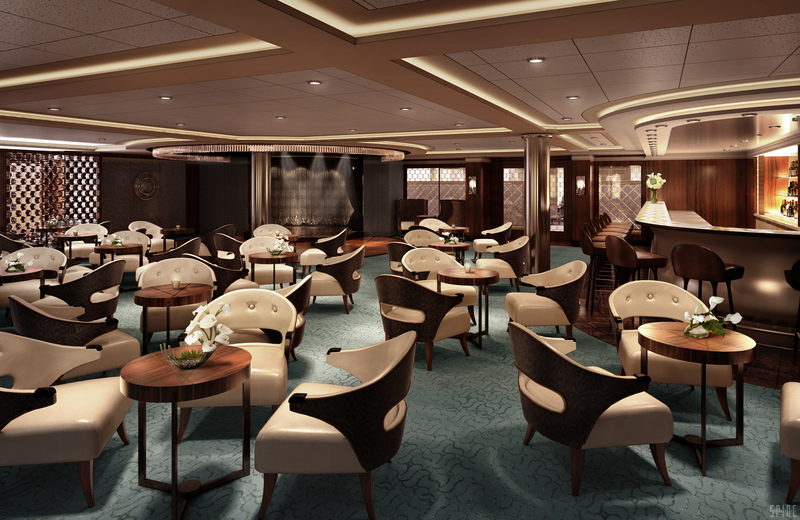 Regent Seven Seas Cruises is adding two new exclusive venues to the world’s most luxurious cruise ship, Seven Seas Explorer®: the Culinary Arts Kitchen and the Meridian Lounge. Elevating cuisine to an art form, the Culinary Arts Kitchen will provide guests with all the ingredients needed to expand their culinary skills in a welcoming environment reminiscent of the most prestigious cooking schools in France in both layout and design. Eighteen individual cooking stations sit atop three long curved rows with white quartzite countertops and stainless steel accents, belaying the complex and richly flavored foods guests will prepare during the classes. Guests attending classes in the Culinary Arts Kitchen will receive highly-individualized instruction, as each student will cook from their own personal workstation for authentic, hands-on training. The culinary workstations are fully equipped with top-of-the-line induction cooktops, stainless steel sinks and a comprehensive collection of additional cooking essentials. A decorative motif filled with abstract images of essential culinary ingredients and French-inspired recipes highlight an accent wall near the entrance of the Culinary Arts Kitchen. The state-of-the-art culinary center also features floor-to-ceiling windows. With its perch on Deck 11, the magnificent ocean vistas will perfectly complement the epicurean delights being prepared within the center. The instruction at the Culinary Arts Kitchen will cover a wide array of topics including healthy cooking, fish and shellfish preparation, perfect food and wine pairings for entertaining, delectable mini-desserts, high-heat grilling, and classes inspired by the destinations visited by the ship. The Culinary Arts Kitchen will debut on Seven Seas Explorer® with more than a dozen unique classes. Steps away from the entrance to the Constellation Theater, the Meridian Lounge is the ideal location to enjoy pre- or post-show cocktail, or simply savor a libation while peering out the floor-to-ceiling windows, soaking in the breathtaking views over the horizon.